Executives of SolTerra Capital, Inc. and Realogics Sotheby’s International Realty (RSIR) jointly announced the commencement of SOLIS – a 45-unit condominium community located at 1300 East Pike Street and scheduled to break ground in early Fall 2018 with occupancy in early 2020. 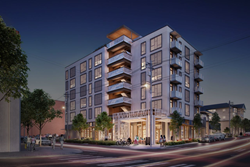 The progressive six-story development is targeting Passive House certification – the first of its kind condominium project in Seattle, which aims to achieve an 80% reduction in its use of energy for heating and cooling. The first new construction “for sale” opportunity in the popular Pike/Pine corridor of Capitol Hill in a decade, homes will range from efficient studios, open one-bedrooms, one-bedrooms and two-bedrooms ranging from 476-sq. ft. up to of 832-sq. ft. offered from the mid-$400,000s to the high $900,000s. Presales will commence in September 2018. Designed by the award-winning architects at Weber Thompson, SOLIS will be built by Cascade Built – a leading Passive House contractor. Building features include an expansive roof top garden and dog run, contemporary interiors with 9-foot ceilings, premium kitchens and bathrooms and oversized windows with exterior automated sun shades. Throughout the project residents will enjoy sun-inspired artisan touches such as sun glazed Spanish tiles and Mediterranean lighting elements. With 3,300-sq. ft. of ground level retail, SOLIS will feature a premier restaurant space boasting a dynamic indoor/outdoor seating with a prime street corner at 13th Avenue and East Pike Street. The homes will be listed by Dave Janssens, a Senior Global Real Estate Advisor and Managing Broker with RSIR. higher price points. According to NWMLS data, the volume of resale homes sold in downtown Seattle below $600,000 has decreased from 112 units during the first half of 2016 to just 39 units in the first half of 2018 because of the rising home prices and the lack of new construction delivering more efficiently-scaled properties. The supply and demand imbalance has caused the average selling price of resale inventory in the 50th percentile to swell from $622 per sq. ft. to $855 per sq. ft. Meanwhile, recent presales of new construction high-rise properties have been commanding average prices between $1,050 per sq. ft. to more than $1,200 per sq. ft.
Interestingly, a new 60-unit apartment building on Capitol Hill called The Cove at 601 East Pike Street that was jointly built by SolTerra set a record when it sold for $921 per sq. ft. as an income property – the highest price paid for a rental community according the JLL, a commercial brokerage familiar with the transaction. Jones cites a recent report jointly developed by RSIR and O’Connor Consulting Group that found the current decade will deliver more than 27,000 multi-family housing units in downtown Seattle, however only 6% of that new supply was offered for purchase and all but 50 of those units have already been presold. The rising cost of land combined with rapidly increasing construction costs (exasperated further by trade wars) is making it more and more difficult for developers to build affordably-priced housing in preferred locations. About Realogics Sotheby’s International Realty (http://www.RSIR.com) - Artfully uniting extraordinary homes with extraordinary lives, Realogics Sotheby’s International Realty is a leading global sales and marketing brokerage firm in the Pacific Northwest. Recognized by the Puget Sound Business Journal amongst the fastest-growing private companies in Washington State in recent years and ranked #8 in the top ten largest residential real estate brands, the boutique real estate firm of 220+ brokers service branches in downtown Seattle, Bainbridge Island, Kirkland, Issaquah and Madison Park. RSIR is a leading project marketing specialist currently representing more than $1 billion in new condominium developments planned throughout the Puget Sound region. About SolTerra Development (http://www.SolTerra.com) – Founded in 2008, SolTerra is an experienced developer of building integrated environmental technology (BIET) and believes this is one of the three core competencies that helps them develop projects that stand out from most others. With more than a dozen new developments completed or in progress in Portland, OR and Seattle, WA – SolTerra Development believes that buildings designed with a strong connection to nature and that encourage social interaction, perform better as investments and places to live, work and visit. EDITORS NOTE: Property renderings, development team headshots, bios and additional market statistics are available upon request.